Topic: Sticky: The Personal Record Thread! Re: Sticky: The Personal Record Thread! Nice. I tried using a projector but the old one I have only has 2048 x 1572 resolution so the biggest board I got on MSX was 100x80, and a new record would be too dense. Might try my college's nice new ones when I go back this fall. I like all the control and game modes. Fun clone. 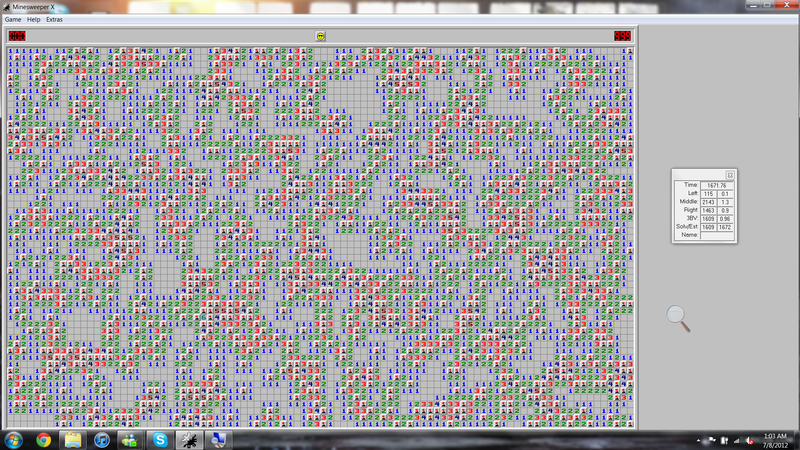 Is there any record for the most number of mines on any size board cleared? Not very hard, just takes patience. Wonder why it wouldn't let me make the board wider.